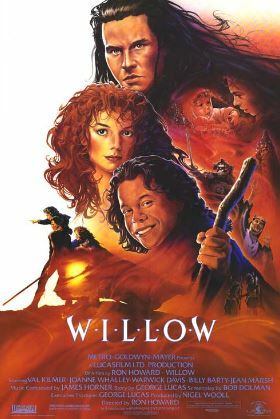 Watching the 1988 movie Willow scene-by-scene. Why? Because it’s freakin’ Willow! This week, we meet the man, the myth, the legend — Burglekutt! It’s 7:15-8:10 on the Blu-ray. Willow isn’t putting up with Burglekutt, though, joking (or not?) that he used magic to conjure his own seeds. Burglekutt shoots back with “You’re no sorcerer. You’re a clown.” He emphasizes that he’s the only one with seeds in town. Willow then says he and his family gathered their own seeds in the forest since last fall. I’m not sure where “the forest” is in relation to Willow’s farm or the village. Somehow I’ve always assumed that Willow’s seeds were gathered on his own land, but that doesn’t seem to be the case. Willow further argues that there’s no law against what they’ve done. This scene is the first mention of Willow possibly doing magic. Later scenes and the tie-in books both come down on him not yet knowing magic. Given the ambiguous nature of magic in this fantasy universe, however, could Willow have actually conjured the seeds with magic? The tie-in books state that the High Aldwin, the Nelwyns’ sorcerer, saw Willow had aptitude for magic at a young age, but Willow’s father insisted that he be a farmer. Could this business about finding seeds in the forest actually be his magic, even if he doesn’t know it? Kaiya hears the children laughing and scolds Willow for leaving them by the river. She runs off. Burglekutt keeps the insult match going, saying Willow’s going to need magic to get his planting done before the rains start. Okay, so Willow and his family gathered (conjured?) the seeds the previous autumn, and they’re plowing the field, which follows seeding, in preparation for rains, which would suggest springtime. So, is this late winter/early spring? The sitcom-ish insults stop as Burglekutt grabs Willow threateningly and lets us in on his real motive. “I’m going to have this land, Ufgood, and you’re going to end up working in the mines.” If Burglekutt is already the richest guy in the village, why does he want Willow’s land? That’s just villainy, I guess. The bigger question is, just what the heck are these mines? How is this agricultural community somehow also a mining community? Perhaps “working in the mines” is merely the Nelwyns’ version of jail. Willow has a nice action hero moment where he pushes Burglekutt off of him. Burglekutt walks off angrily. Willow’s pig gets in the last word, oinking at Burglekutt.